We celebrated L's first birthday recently and so of course the occasion called for a new dress. Well, two dresses - one for her professional pictures and another for her birthday party. I had an idea in mind of a dress with a crossover bodice, but I couldn't find an existing pattern for one in my stash, so I did a little bit of redrafting. 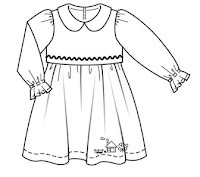 I started with Burda Magazine 11-2007-136, which I chose because the fitted bodice and full skirt were a good starting point, then muslined it to check the fit, omitting the collar and shortening the sleeves and skirt. After that I altered the pattern again to remove the puff sleeve gathers, raise the waistline, and make a crossover front bodice. It sounds like a lot of work, but things go very fast when you're working with tiny pattern pieces. This is the birthday party dress. The fabric is a girly sweet cotton lawn from Denver Fabrics (also available in another colorway, if you're interested). The leggings are Ottobre 1-2011-9, I'm going to make another pair of them and I'll talk about them more after that. I made the same dress in white swiss dot for her professional photos. The bloomers are Burda Magazine 7-2008-134 (also made them a while ago for my niece). And I made the fabric flower belt and hair clip in a few different colors since I wasn't sure which color would look best with the photo backdrop. That was a busy week. But I love how the photos turned out. Here are a few more photos from L's birthday party. The party was totally for me, not for her. One of L's friends gave her a set of butterfly wings, they were adorable but she kept taking them off. Oma flew in for the party too. 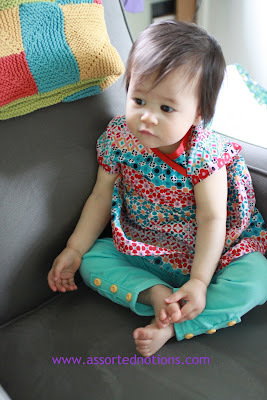 We made fringe streamers using the tutorial from Oh Happy Day. They were gorgeous and so easy. Initially, she wouldn't dig into her cake, I had to give her a slice and she ate it as daintily as a one-year-old could. It wasn't long before it was all over everything though. We hung a fabric bunting in the entry way. I found the fabrics at The Quilting Loft in Seattle and priority mailed them to my mom the week prior to her arrival because I knew I wouldn't have time to make it. I'm so lucky to have a mom that sews, too! It made such a difference, too - really added to the fun party vibe. We also hung a collage of pictures of L's first year (on the TV, which was the only good place for it); I totally swiped that idea from a birthday party we were at a few weeks ago. Coming up - women's apparel! Yes, I actually sewed something for myself. I promise this blog hasn't gone totally baby. I made a Tracy Reese/Vogue dress, I love it. Little L is such a cutie!Happy first b-day to her! The dress turned out great. Looks like it was a wonderful celebration. 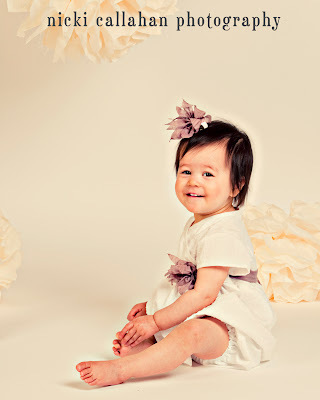 Beautiful dresses for a beautiful One Year Old. She is sooooo adorable. I really like the dress for the photoshoot and puleeze post as much about the precious princess as you want. This is fun stuff too! Oh, I LOVE the ice blue accessories on her with the white dress. Great job! What pretty dresses on such a beautiful girl. Please feel free to post as many baby clothes as you like. I love seeing your the ideas. We all know babies if we don't have any of our own (mine are 20 and 26 now). Happy Birthday and Happy Mother's Day! Precious beauty. Happy Birthday to your little one and Happy Mother's Day! Happy Birthday to gorgeous L , the dresses you made for her a so lovely. So cute! I love the dotted swiss version. She is so adorable! 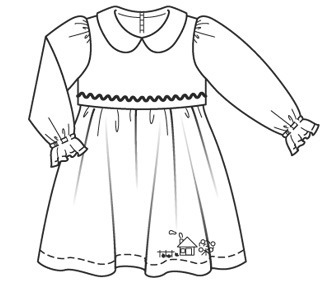 All the muslin and changes on the pattern sounds like a lot of work. I wish I had as much patience as you do! Sweet sweet dresses that take me back. My daughters (now in teens) are still wearing teeny weany dresses, but not neccessarily ones I approve of! Both dresses are absolutely precious and I really love the fabric banner, too. Those dresses are so sweet! 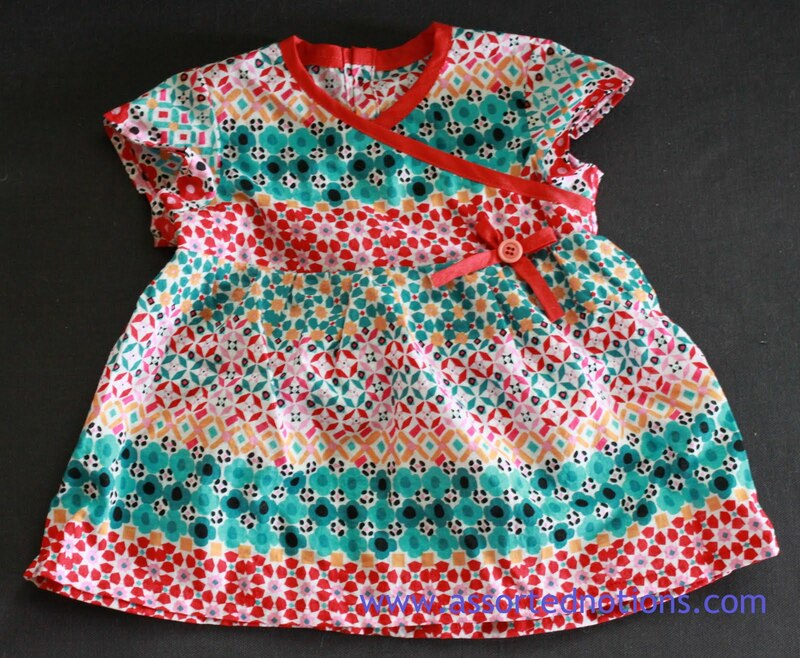 I especially love the printed party dress. Too too cute for words!! Perfect little birthday dresses! I love that you made different flower sets to test against the background. You can never be too prepared. Love the dresses and the party decor! I can't get over the flowers you made for her dress. All so unique and thoughtful. She has no idea how lucky she is.